We are very pleased to announce the first Oliver + S fabric collection, City Weekend, produced by Moda. Here’s a preview for you. City Weekend debuts next month at Quilt Market, where fabric store buyers place orders for the following season. We don’t want to discuss too much about the collection yet (since it’s not going to be available in stores for several months), but we are looking forward to sharing more details with you when we return from Quilt Market. Suffice it to say that in addition to the printed cottons, City Weekend also includes interlock knit fabrics. So of course we’ve been busy designing some new Oliver + S patterns to highlight the knits. Stay tuned for more details! Congratulations Lisel and Co! I am saving my pennies . . .
Oh, Liesl! I’m positively SWOONING over here! Congratulations!! They all look soooo great and just the perfect complement to O+S patterns. What an amazing surprise!!! Congrats! What a beautiful line! I am –so– excited about these prints, Moda are such high quality fabrics, perfect for kids clothes. And knits! I could swoon. Wow, that is so exciting. Congratulations to you, and fantastic for us. Since I have absolutely loved everything that O&S has created, I can’t wait to see the complimenting fabrics. Patiently (not really) waiting to see the collection. Love that pile of fabric…can’t wait to be able to purchase some! Yay!!! Beautiful fabrics! I cannot wait. And knits too?!? Really, really exciting news! how exciting! sorry for this basic question, but what is interlock knit fabric? Interlock is a more stable knit than T-shirt jersey. It doesn’t curl at the edges and is very easy to sew. We’ve really been having a lot of fun working with it because it can be made into such a wide variety of apparel types: little tops, dresses, pants, you name it. You don’t need a serger to sew it–we’ve been using a regular sewing machine. And of course we’ll teach you how to sew it in our upcoming patterns. I think you’re going to enjoy working with it–the patterns come together very quickly and look terrific when they’re finished. Wow, that looks like a great collection! I can’t wait to see it in person. Congratulations! Congratulations- it looks beautiful! And, more Oliver + S is always a good thing! I’m looking forward to the knits, especially. Kudos for branching out! Lovely collection! Fantastic colors and the fabric looks so soft! I am beyond excited! 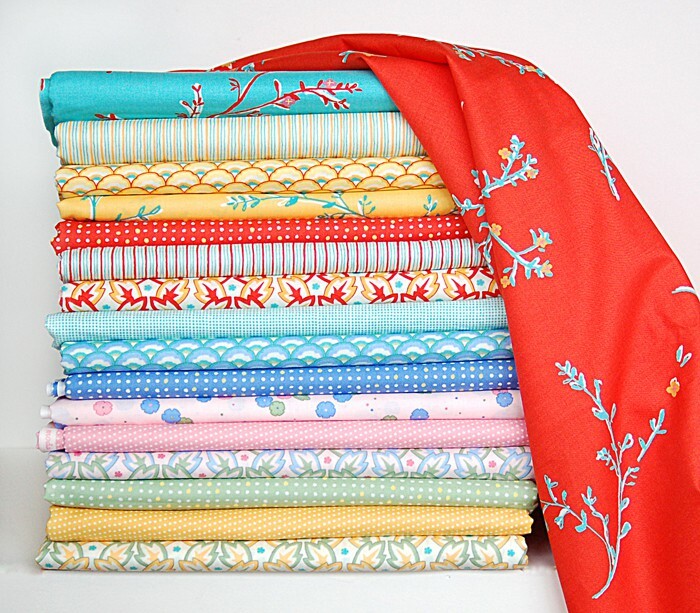 I love the fabrics in the picture and cannot wait to choose some to sew for my daughter. congrats!!! it looks wonderful! looking forward to seeing more! OMG – Now I have to buy more fabric! Liesl, you’re killing me! It looks beautiful. How exciting! I can’t wait to get a better view! thanks for the answer to my question. although i do love much of the quilting cotton available, sometimes both my kiddos and i want something a little closer to knit (without compromising on all the cuteness) to make your patterns in…. sounds perfect! can’t wait until it’s available and also for the upcoming patterns!! wait, did you say interlock? SOOOO excited!!! Congratulations! Can’t wait to see it all! oh oh oh, I’m freaking out here! yay for you! What a lovely idea and so happy for you! More quality knits on the market is great! Oh Leisel how exciting, congratulations! I can’t wait to see it properly! I’m so excited! They look beautiful and knits too. Wow! How exciting! I can’t wait to see what knit patterns you come up with to go with your fabric! They look lovely. Are you planning to sell the interlock fabric yourself or only through shops? I know my local quilt shop is reluctant to carry garment fabrics. I cannot wait! These are exquisite. Thank you for sharing a peek. If the rest look like that red, I can’t wait!!! That one looks amazing, I need to sign up for a few yards of it right now. Congratulations… can’t wait to see more. Knits! Oh Liesl, you’re my hero. Aaaaaaaah!! There are no words. Yipee! Leisl – these are beautiful! Congratulations on the fabric line. Are you going to have little people instead of colour spots on the selvedge? Are these available, I saw an outfit in Flickr made up, was that lady trying them out? The fabric won’t be available for several months yet. What you saw in the Flickr group were samples made for Quilt Market. Thankyou, they are just perfect! gorgeous! will have to get some of this for my own store!!! !